So yesterday we drove to the border, had to cross to the US and re-enter Canada to access a building we could easily access in Canada, but we needed a cute little piece of yellow paper. On this piece of paper "work permit expires tomorrow". Um, I could have told them that. Oh, yea, we did. But they still made us leave and come back. Oh well. We paid our tolls to and from and finally got the privilege to sit in the customs building for two hours while our documents were renewed. Thank goodness for electronics! 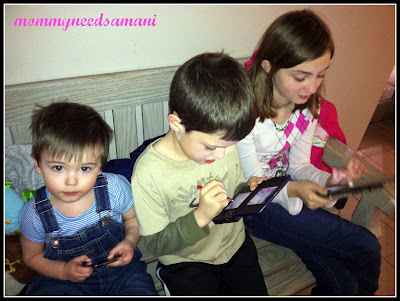 Oliver is playing with daddy's ipod touch, Josh & Chloe are playing with their DS's. Oliver lost interest soon after this picture was taken. We walked in circles and I carried him a lot.